Boris for PM? Don't make me laugh! Demob-happy Cameron jokes in the Commons as he faces MPs for first time since resigning - but where's his most likely successor? David Cameron cracked jokes today as he faced MPs for the first time since his humiliation in the EU referendum - but Boris Johnson was nowhere to be seen. The Prime Minister seemed demob happy as he appeared in the Commons, quipping that he thought he was having a 'bad day' until he realised the scale of the Labour coup against Jeremy Corbyn. He also urged the newly-elected Tooting MP took keep her mobile phone on as she 'might be in the shadow cabinet by the end of the day'. But Mr Cameron was defiant about his controversial 'Project Fear' warnings about the consequences of Brexit, saying we were already seeing the fallout from the decision. And he hit out at 'despicable' racist incidents in the wake of the referendum Leave vote, saying they 'will not stand for hate crime'. The appearance came as it emerged that Mr Cameron's successor as Prime Minister will be appointed by September 2 at the latest. 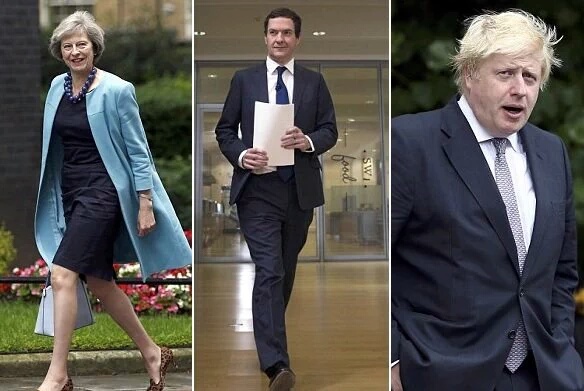 The winner of the Conservative leadership contest will be announced on that date, with David Cameron potentially handing over the keys to Downing Street the same day.